The day after my son’s 3rd birthday, I was at the beach with my family and just as a storm was rolling in, my husband discovered a starfish. He held it in his hand for my son to see. The look of sheer joy on my son’s face as he gently touched the starfish, the water droplets coming off my husband’s hand, the deep blue clouds in the distance, was a moment I wanted to capture, to freeze in time. Fortunately, I had my camera with me, but I didn’t know enough about it to get the image “right.” I can’t really explain it, but I think it was at that moment that photography found me. I was hungry to learn anything and everything I could about photography so that I would always be able to document my boys just as I remembered them in those very special moments. Fast forward to now, over 6 years later, and I’ve started this business– one of the scariest, most amazing adventures of my life. So who am I? I’m mom to Ben, my sweet, sensitive, hilariously funny 9 year old boy and wife to Chris, my wonderful husband who I’d describe, after tacking on a few years, exactly the same way as my son : ) He is my rock, my soul mate, and I would have never been able to embark on this journey without his unwavering love and support. But me? In a nutshell, I’m a little impulsive, probably more than a little neurotic, loyal to a fault, and a bit stubborn, as any good redhead should be : ) Oh and I love those sweet, silly boys of mine so much that it hurts. 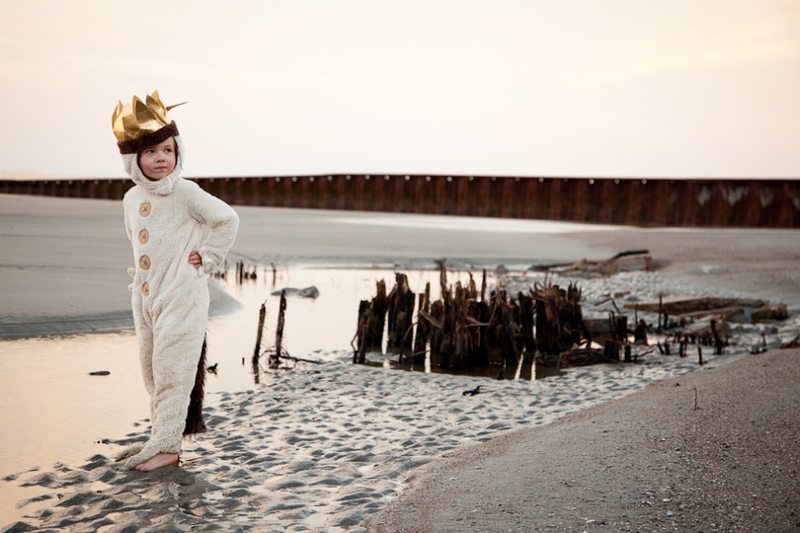 So not long ago, being the impulsive, neurotic, stubborn girl that I am, I decided I wanted to capture an image of my son in his Max costume at the beach. But it wasn’t just any beach, it was a very special beach about a 10 minute drive from the spot where we saw that starfish and this whole crazy adventure began. Appropriately, Where The Wild Things Are had been my favorite book as a child, and it was my son’s favorite book as well. It will always hold a very special place in my heart. I desperately wanted to create this picture to remember all the countless times we roared our terrible roars together and commanded the wild things to “Be still!” when Ben was oh so small. The only slight problem was that the place I had in mind was about 6 hours away. Being the understanding hubby that he is, Chris entertained my whim and we set off on yet another adventure. Only about an hour of light remained once we arrived, but that single hour was nothing short of magical. We got to watch my sweet, shy boy, the spitting image of his daddy, become Max for an hour, gleefully shouting commands to his subjects and conquering his new land. It is a day we will never forget and fortunately this time, I was able to capture the moment just as I had imagined it. I love the tender moments, the funny ones, the happy ones, the sad ones– they all melt my heart in their own little way. I love to spend time with you and your family and feel insanely privileged to help you capture those treasured moments that pass far too quickly. And if you have some crazy wonderful idea in your head, nothing would make me happier than to try to make it come alive for you too. © 2019 Christina Rose Photography|ProPhoto Photography Theme by NetRivet, Inc.